I've designed a business card in Quark 2017. It contains text, a logo, a few colors, pretty much the normal stuff. I was going to order business cards from Moo, and they provide templates for Illustrator, Photoshop and InDesign (but NOT Quark). They also provide a template for JPEG, which I was kind of planning to use unless someone here thinks it would be easier for me to Export from Quark to Illustrator, Photoshop or InDesign. And there's a few more. But I don't have a clue about ANY of these things. Does anyone have a suggestion about the easiest way for me to create what Moo needs from my Quark file? I highly recommend using a PDF generated from QuarkXPress versus exporting to a JPG file. The template (and their overall instructions on the web site) leave a bit to be desired. But, they are more or less like any other on-line automated specs. I have linked to a ZIP file at the end of the post. In that ZIP file there is a QXP Project. The project itself has 3 layouts: (1) Moo's specially-sized business card, (2) Moo's standard-sized business card, and (3) Moo's square business card. These are the USA sizes, I don't know where you are located or if there are other sizes. These are the three I saw and quickly put the QXP project together with. Feel free to let me know if there is some other size needed. The other file in the ZIP is an output profile (it's an XML file type). Moo wants a PDF/X-1a type of PDF, and using the GRACoL ICC color profile. This is how this output profile is set up. But it depends on the GRACoL profile being installed. You can import this color profile into QXP and it will be all set up properly for exporting to PDF and choosing this PDF output profile. If the above makes sense, you're all set. However, if you need any help, please feel free to ask questions and we can help you. Doesn't XPress open InDesign files now? Like mentioned above, Q can open IDML, but not INDD (native file format). The template above at Moo, and many/most other templates one can find at on-line printers are in IDML format, but some I have ran across are actual ID templates (INDT) files, which Q cannot open. There are issues with the Moo template (even opened in ID), which is why I made a new Q file. Wow, wow, thank you SO MUCH for all this help. Obviously, I'm a bit...how would you say it...of a complete novice at this...just trying to create a business card. Let me digest what you've all written and I'm sure I'll have some followup questions. But so far, THANK YOU! I check in a few times a day, so there may be some delay before I see more responses. Ok, here's my next question. I agree that at this point, having designed the card in Quark 2017, I should try to fine tune it and send Moo a PDF (or possibly JPEG). OK. So, I'm going to try to match my RGB colors using CMYK. Here's my first problem. I honestly don't think I can match the RBG colors using CMYK. I don't know much about color - RGB vs CMYK vs Pantone, etc - but in what little I've played around with the CMYK, it just doesn't seem possible to match my RGB colors. Any suggestions on this? 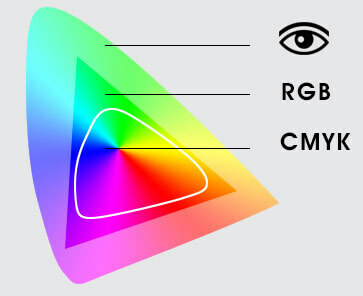 In theory, should a person be able to get quite close to any RGB color using CMYK or vice versa, etc? I have kind of a lilac blue color, and I just don't see how I can come anywhere close to it using CMYK. Actually, in trying to learn about this, I came across this, "Have you ever received a print and upon inspection realized some of the colors were not what you were expecting? You’re not crazy! It can happen if you don’t pay attention to which color profile you are using when you design. Your colors look different on screen than in print because printing uses the CMYK color profile while computers display RGB color values." So if you're designing a business card on a MacBook Pro, the display of which is outputting RGB, how on earth do you get your colors right on the business card you're designing? I mean, there must be some sort of workaround? It sounds like the color(s) you are using fall into an area outside of what can be reproduced using CMYK. What is the color value of the blue color? There are two colors in the blue realm. Thanks for the explanation, although I'm still baffled as to the seemingly "limited" range of CMYK. Yes, those two blues will be problematic as regards brightness but likely will print a tad brighter in tone if using a gloss paper stock. The green is fine. In general, I often us RGB for on-line print establishments. I did that for some business cards at Vista Print. I don't know if one can get away with it at Moo.